FILE - South Sudan's Vice President Taban Deng Gai addresses the United Nations General Assembly, Sept. 23, 2017, at U.N. headquarters in New York. South Sudan First Vice President Taban Deng Gai said he will not step aside if rebel leader Riek Machar returns to Juba, reversing his earlier stance on the matter. 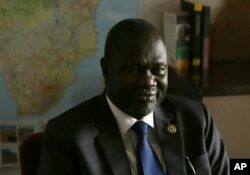 Gai told journalists in Juba on Wednesday former VP Machar is not interested in bringing peace to South Sudan. "I don't think Riek Machar has a place in the Transitional Government of National Unity. He will say that he wants to come back with a huge army, he wants to have two parallel armies in Juba," said Gai. During Gai's swearing-in ceremony in 2016, he said he would gladly step aside in favor of Machar, who had fled Juba after his forces clashed with government troops in the capital that July. "I am only filling a vacancy according to directives and dictation of my leadership. If situation dictates itself again, that Riek Machar comes back to this position, I don't think it will be me ... to be an obstacle if that can bring peace to my country," Gai said at the time. Critics have suggested both President Salva Kiir and Machar should get out of politics, arguing that is the only way to restore lasting peace in the country. Gai doesn't see it that way. "I don't predict Salva Kiir leaving power because he is the equilibrium of the SPLM [ruling] party. He is the equilibrium of the nation," said Gai. Gai called a news conference in Juba to talk about his recent tour of five South Sudanese states, which he said was aimed at convincing communities in the region to end child abductions and cattle raids. He said the national government is determined to put an end to such violence in 2018. "Let us use a maximum force of the government to stop these criminals from not allowing our citizens to be peaceful," he said. "Actually we may even use the gunship, even the planes, we can bomb them. And we are going to do this." While he said the government will provide humanitarian assistance to South Sudan's millions of vulnerable people as best it could, Gai called on donors to come to the rescue. "We are going to continue appealing very much to our partners," he said. "If they love South Sudan, they want peace in this country, we must provide peace dividend.Donors must support the government to provide more services as peace dividend." The SPLM In Opposition has accused Gai of violating last month's cease-fire agreement by traveling to Jonglei state with a large number of troops two weeks ago. The government has denied Gai was in violation. Meanwhile, the east Africa bloc IGAD has urged all parties in South Sudan's conflict to comply with the Agreement on the Cessation of Hostilities (ACOH) signed last month in the Ethiopian capital Addis Ababa. The IGAD Council of Ministers, meeting on the sidelines of the African Union summit, released a statement Thursday calling on the warring parties to acknowledge the ongoing violations, including killings, sexual violence, recruitment and deployment of child soldiers, and looting by both government troops and rebels in various parts of South Sudan. The ministers urged warring parties to take immediate action to demobilize all child soldiers and return them to their homes. The Washington-based Enough Protect released a report Thursday criticizing the African Union for repeated lack of action against what the activist group called 'spoilers of the peace process in South Sudan." It argued the lack of action against violators of peace agreements have emboldened the leaders of the warring parties to continue the escalation of armed conflict. The Enough Project recommended the African Union impose sanctions on the chief of defense staff for the South Sudan army, Lieutenant General James Ajongo, and the SPLM-IO's chief of defense staff, Lieutenant General Simon Gatwech Dual. 'Beyond these two figures, other military and political officials who share decision-making responsibilities with Ajongo and Gatwech should also be subject to targeted sanctions, visa bans, and investigations into money laundering through regional banking institutions," the Enough Project said.